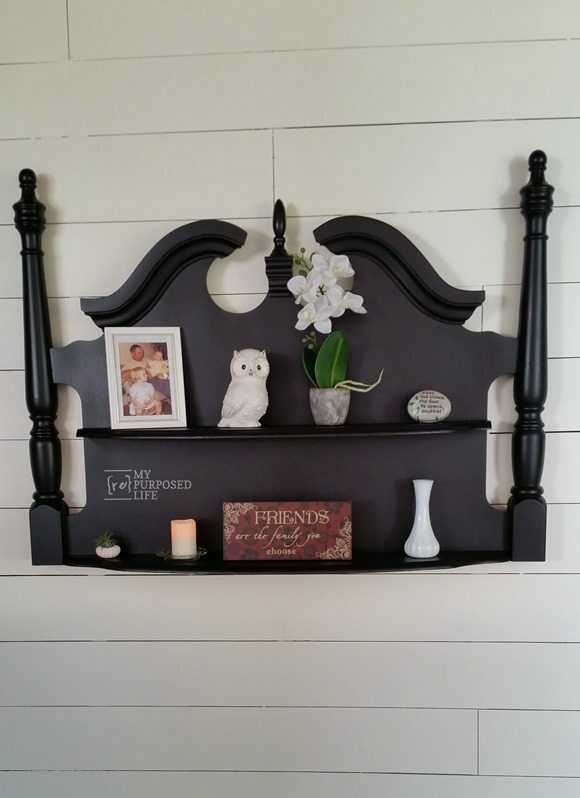 This headboard shelf coat rack is something I’ve been wanting to do for awhile. It turned out better than I expected. I picked up this table at a yard sale for $1. I used the base of the table for a repurposed desk into a chest. I cut the sides off on my table saw to make a black headboard wall shelf. That left me with one long skinny piece of a table with curvy ends. I had this free headboard in my stash. I cut the legs off and cut each of the curvy ends of the table off using my compound sliding miter saw. This is a dry fit. I actually ended up taking them back to the saw to cut a little more off the depth. I used my Kreg Jig (micro jig) to drill some pocket holes to hold the shelves onto the headboard. I mixed up some diy chalky paint primer with Polished Pearl and gave it a quick coat on the front and the back. I find that many times a coat of primer totally gets me motivated to finish a project. Once all the colors come together and it blends, it makes me smile. I had to make a few adjustments on the back. The pocket holes protruded slightly so I added a thin piece of plywood. In order to attach the coat hooks, I added a piece of a 1×4. I glued and screwed the 1×4, and glued and nailed the thin plywood. I added some small scraps of 1x in order to allow the headboard to hang on the wall. It needed to have something to fill in the depth of the bed posts. Then it was time for a coat of Polished Pearl in semi-gloss using my Homeright Finish Max. The Finish Max gives such a great finish on the curvy bed posts of this shelf coatrack. After the paint dried really well, I added some ball hooks from D. Lawless Hardware. If you need tips for installing coat hooks, see my Red Headboard Shelf Coat Rack project. I love how this coat rack shelf turned out! Plus it got another headboard out of my inventory. This is the black headboard shelf I made with the two long ends of the $1 coffee table. Here is the base of the table used for this lingerie chest made from an old desk. Three great projects out of one yard sale table. I still have the very middle of the table, but I don’t expect to use it for a project. Sharing here: Inspiration Monday and DIY Sunday Showcase bowth with tons of inspiration for everyone! disclaimer: I am very happy to be a Homeright brand ambassador. I was compensated for my time, however ALL thoughts opinions and projects are my own. Great project. Thanks for sharing with us at Throwback Thursday. Please share and join us again next week. Amazing! I love how your mind thinks, this is a brilliant idea! Well done! I would like to invite you to share some of your work at my Making Broken Beautiful party this week! It runs every Thursday thru Sunday. I do hope you will come share some inspiration! I like the black headboard shelf because of the lines, but I would probably be able to use the smaller white “coat hanger” best since I live in a small space. I believe the size would dictate who would use what. They’re both gorgeous pieces and such a clever way to repurpose headboards and coffee tables. Love re-using anything. Thanks so much Barbara for stopping by and checking out my headboard project! I love repurposing old pieces! I appreciate your nice comment! These are so beautiful!!! I would not which one to choose! Awesome! Thanks for sharing at #inspirationmonday pinned it, love it! That looks unique… Both if the last two shelves are great! I bet they quickly! Great job! * sell quickly! Also— a favorite? That’s a hard one! I love the white one for the hooks aspect. I like the black one for the tall finials! lol! You know me —indecisive! The both rock, Gail, but I’m partial to the black one. What I love the MOST is your ability to see the possibilities in every angle and curve of a piece of conventional furniture!